The Autotech HPFP kit offers the highest quality, solid engineering, and the greatest value from any high pressure fuel pump on the market. 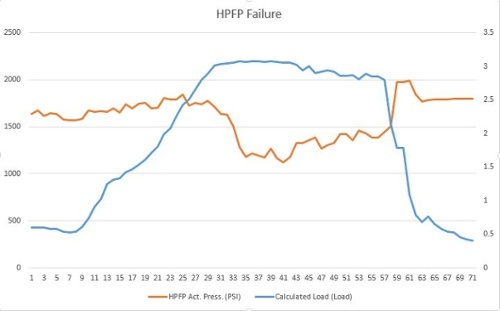 The Autotech HPFP can achieve flow rates 50% higher than the original pump, essentially removing pump limitations from the equation, even on high-end turbo upgrades. The problem with the Mazdaspeed 3 and 6 is that the factory High Pressure Fuel Pump (HPFP) internals can't handle the extra fuel demand brought on by upgrading to higher flowing downpipes and intakes. When you add these upgrades, the factory fuel pump will begin to drop like what is shown in this graph. As you can see, fuel pressure drops hard at peak load and has trouble keeping up. With an upgraded Autotech HPFP, your car will be able to maintain fuel pressure no problem. In fact, the Autotech HPFP Upgrade is the only fuel mod between you and your Mazdaspeed 3 or 6 and making up to 400whp. It is a good idea to have a Cobb Tuning Accessport at the time of this upgrade as that will allow you to monitor your fuel pressure and give you peace of mind that the HPFP internals were installed correctly. Not to mention all the tuning benefits you get as well. Make sure and ask us about our Autotech/AP Combo Deal! Autotech Fuel Pump Internals continue to be the benchmark that imitators strive to reach. However, it is not easily duplicated. Each piston (9.8mm diameter) and cylinder in Autotech HPFP kit undergo a high-precision grinding processes many times during manufacturing, ensuring that the most precise tolerances are maintained through the final step. Not the cheapest way to make them but the best way. Autotech was the first to incorporate plasma DLC coating on HPFP components to reduce friction losses and increase performance. Others have tried to follow by adding a coating to their parts. However, the DLC process alone is not enough, it is not a cure for substandard precision. The parts must be precisely engineered for the process to take full advantage. The success we have in the field can attest to that. Want more info on why you need an hpfp upgrade on your Mazdaspeed or VW? Check out our blog article about it right here. Fast shipping. I had the old hpfp internals out and ready to go for when my new internals kit arrived. The o ring on the part needing to be removed was shot so I had to order that from another vendor. Just keep an eye on that o ring. Replace it if you question it. Instruction booklet was very well written and helpful. Must have if your adding bolt on, no more ticking noise . I know it’s a big investment on a $300+ part, but once you put it on it will make you feel it was worth way more. No more high ticking noise and no more hesitation when I’m WOT. All I have is some bolts on and a new k04 turbo and it’s run beautiful. Thank you Auto-tech for the part and thank you edgeautosport for the support to our community of speeds. I’ve owned mine since 2008 and still driving it.